Consciousness research is developing rapidly. 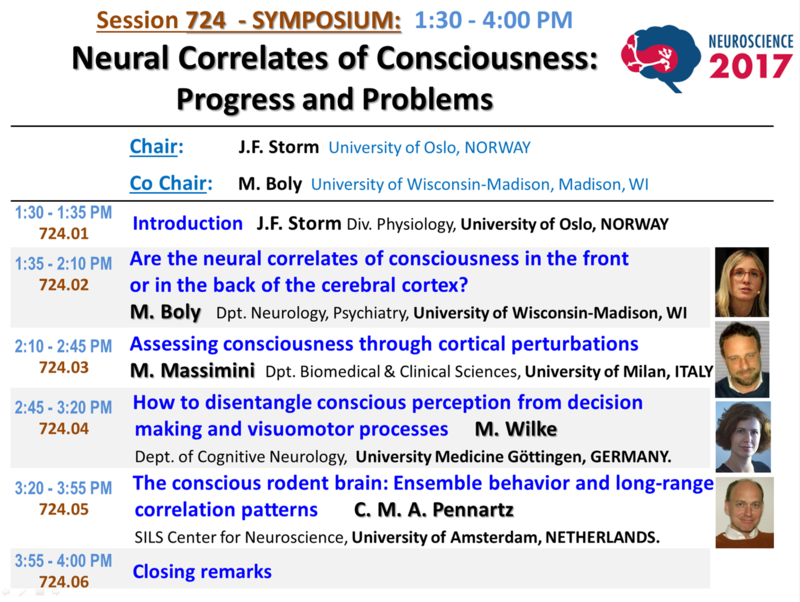 Using evidence from brain injury in patients and physiological and behavioral studies in humans and related animals (single neuron, fMRI, EEG, TMS, intracranial recordings), the symposium will highlight how different conscious states and contents arise in the brain. Speakers will discuss different experimental approaches and theoretical frameworks as well as the medical and ethical relevance of this area. The nature of consciousness is widely regarded as one of the great challenges in science. 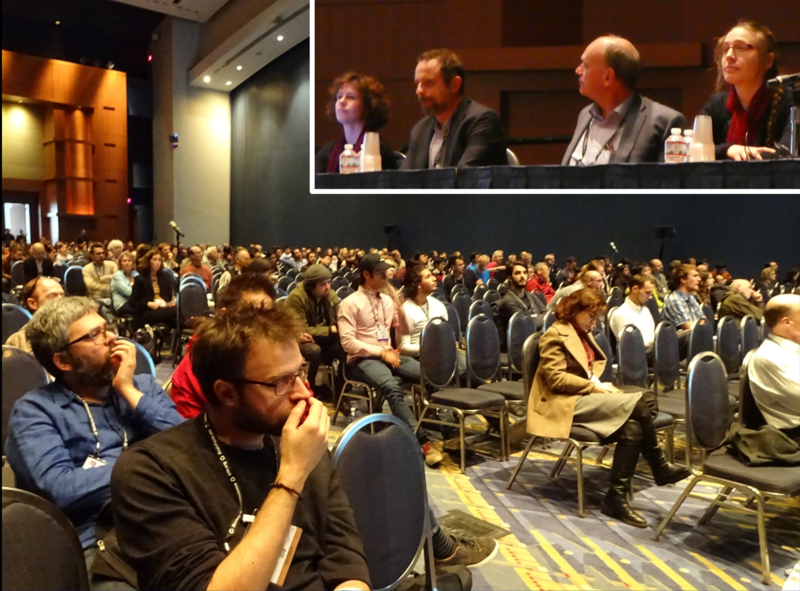 Over the past decade there has been substantive empirical and theoretical progress in this field. 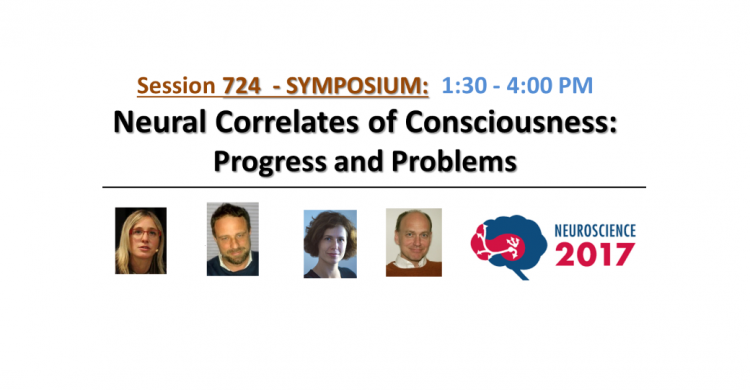 This symposium presents results from this recent surge in consciousness research. Melanie Boly will review evidence of frequent dissociation between consciousness and responsiveness in patients with brain damage. 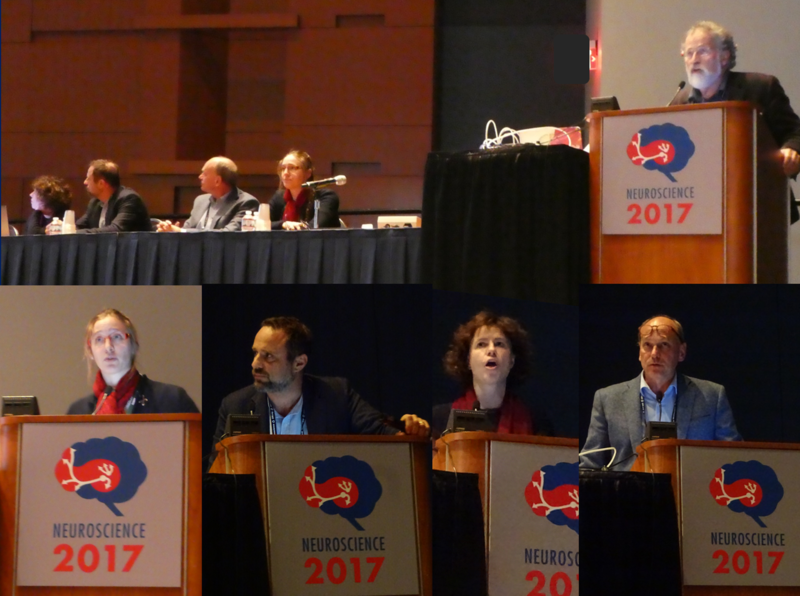 She will present recent evidence that after ruling out confounds, the anatomical neural correlates of consciousness are primarily localized to a posterior cortical hot zone, rather than to a fronto-parietal network involved in task performance and report, and discuss the potential clinical applications of these findings. Marcello Massimimi will describe the rationale and validation of the perturbational complexity index (PCI), a theory-driven empirical metric designed to gauge the brain’s capacity for integrated information. He will show how this index can be employed at the bedside to assess and stratify unresponsive patients, independently of sensory processing and motor/executive functions, and will highlight physiopathological implications. Melanie Wilke will discuss how to disentangle conscious perception from decision making and visuomotor processes. Drawing conclusions from electrophysiological and fMRI experiments in monkeys and humans, she will address which signals and brain regions continue to correlate with conscious perception without the requirement of a behavioral report. She will also show consequences of parietal and thalamic pulvinar perturbations on conscious perception versus visuomotor decisions. Finally, she will discuss how to avoid or control for report-related confounds in future studies of conscious perception. Cyriel Pennartz will focus on the theoretical delineation of requirements for animal brains capable of sustaining consciousness. Next, he will review recent advances in uncovering neuronal population correlates of visual stimulus detection, which is considered an important component of sensory awareness. Finally, he will zoom out from visual cortex to larger interconnected neural systems, probed with multi-area ensemble recordings to investigate changes in local and long-range functional connectivity across the sleep-wake cycle. 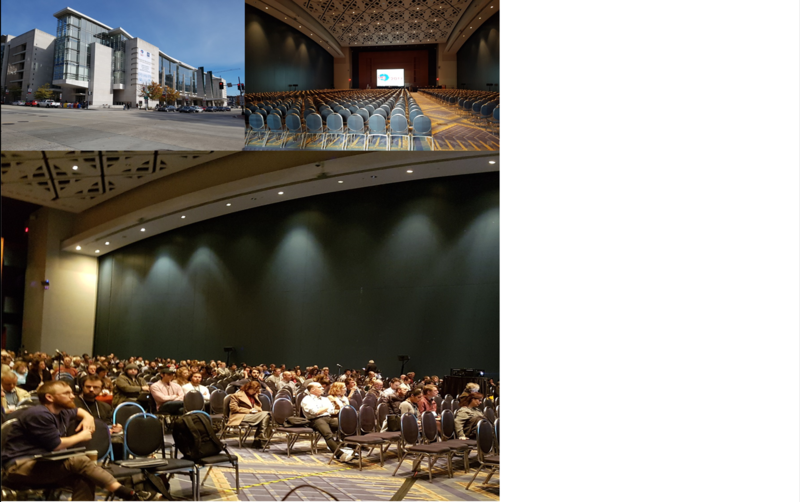 Ballroom B (1100 seats)was quite full during the symposium 15 Nov.
J Neurosci. 2017 Nov 8;37(45):10882-10893. doi: 10.1523/JNEUROSCI.1838-17.2017. 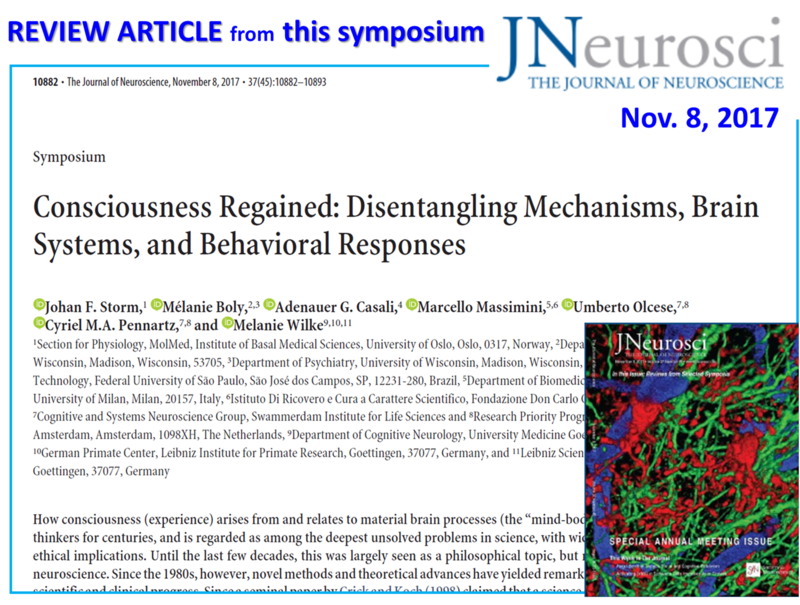 Consciousness Regained: Disentangling Mechanisms, Brain Systems, and Behavioral Responses. Storm JF1, Boly M2,3, Casali AG4, Massimini M5,6, Olcese U7,8, Pennartz CMA7,8, Wilke M9,10,11. How consciousness (experience) arises from and relates to material brain processes (the «mind-body problem») has been pondered by thinkers for centuries, and is regarded as among the deepest unsolved problems in science, with wide-ranging theoretical, clinical, and ethical implications. Until the last few decades, this was largely seen as a philosophical topic, but not widely accepted in mainstream neuroscience. Since the 1980s, however, novel methods and theoretical advances have yielded remarkable results, opening up the field for scientific and clinical progress. Since a seminal paper by Crick and Koch (1998) claimed that a science of consciousness should first search for its neural correlates (NCC), a variety of correlates have been suggested, including both content-specific NCCs, determining particular phenomenal components within an experience, and the full NCC, the neural substrates supporting entire conscious experiences. In this review, we present recent progress on theoretical, experimental, and clinical issues. Specifically, we (1) review methodological advances that are important for dissociating conscious experience from related enabling and executive functions, (2) suggest how critically reconsidering the role of the frontal cortex may further delineate NCCs, (3) advocate the need for general, objective, brain-based measures of the capacity for consciousness that are independent of sensory processing and executive functions, and (4) show how animal studies can reveal population and network phenomena of relevance for understanding mechanisms of consciousness.